This map displays the geographic distribution of HRSA grantees with active grants managed by different bureaus and offices within HRSA. This map displays the geographic distribution of active grants managed by Bureau of Health Workforce (BHW). This map displays the geographic distribution of active grants managed by HIV/AIDS Bureau (HAB). This map displays designated Primary Care Health Professional Shortage Areas (HPSA). This map displays the geographic distribution of Primary Care Health Professional Shortage Areas (HPSA) facilities. 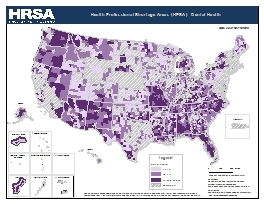 This map displays designated Dental Health Professional Shortage Areas (HPSA). This map displays the geographic distribution of Dental Health Professional Shortage Areas (HPSA) facilities. This map displays designated Mental Health Professional Shortage Areas (HPSA). 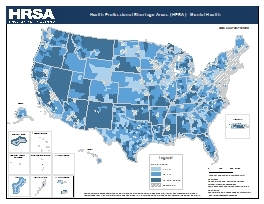 This map displays the geographic distribution of Mental Health Professional Shortage Areas (HPSA) facilities. This map displays designated Medically Underserved Areas (MUA) and Medically Underserved Populations (MUP). This map displays the locations of open job opportunities managed by the Bureau of Health Workforce (BHW) National Health Service Corps (NHSC) program. 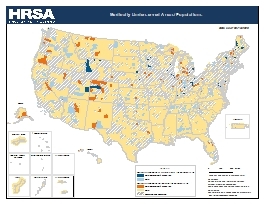 This map displays the geographic distribution of critical access hospitals from the Centers for Medicare & Medicaid Services (CMS) Provider of Service (POS) file over Federal Office of Rural Health Policy (FORHP) rural health areas. 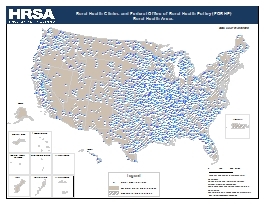 This map displays the geographic distribution of Federally Qualified Health Centers (FQHCs) from the Centers for Medicare & Medicaid Services (CMS) Provider of Service (POS) file over Federal Office of Rural Health Policy (FORHP) rural health areas. This map displays the geographic distribution of National Health Service Corps (NHSC) personnel over Federal Office of Rural Health Policy (FORHP) rural health areas. This map displays the geographic distribution of rural health clinics from the Centers for Medicare & Medicaid Services (CMS) Provider of Service (POS) file over Federal Office of Rural Health Policy (FORHP) rural health areas. 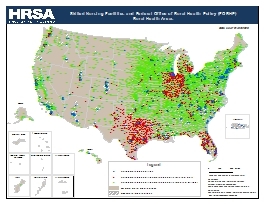 This map displays the geographic distribution of skilled nursing facilities from the Centers for Medicare & Medicaid Services (CMS) Provider of Service (POS) file over Federal Office of Rural Health Policy (FORHP) rural health areas. Note: An active grant is defined by HRSA as a grant whose project period end date is beyond the current date. Grants can be active whether or not they have received an award funding in the current fiscal year.